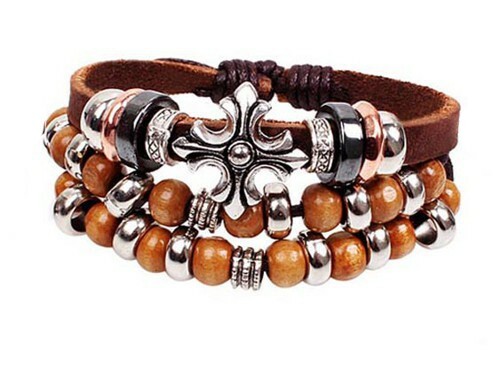 Funky three-row surfer bracelet featuring an ornate medieval shield, flanked by silver and wooden beads on a tan cowhide band, plus two rows of tan wooden beads, interspersed with ornate and smooth rings, threaded on cord. All coming together via a sliding knot that is adjustable between 19 - 28cm (7½" - 11"). Width 5.5cm (2¼").